This was our sad, dilapidated hot tub before this last weekend. Talk about an eyesore. I’m a bit embarrassed to share this with you! In our experience it is easy enough to pick up a hot tub from Craigslist, but usually they look pretty shoddy. My husband got this hot tub just over five years ago and we had an electrician do some work on it. It was showing its age then, and when we returned to our home after renting it for a couple of years it was looking very sad, indeed. This poor wreck has sat on our to do list for a year, drained and pleading for some attention. This past weekend we finally tackled the beast, and now I’m going to show you how you can get your hot tub all ship shape in a weekend as well. I should say right off the bat that this is about repairing and restoring the casing to a hot tub, not the mechanical parts. I prefer to step aside and let the professionals do the work when it comes to most electrical work. We removed the panels, which in the case of an old wood wrap are usually just screwed on. Pay attention and take a few photos as you dismantle the shell so you can be sure everything goes back in properly. Our wrap consisted of an internal layer of polystyrene insulation, followed by OSB, and then topped with cedar planks. Under the shell there is a sort of footer or toe kick. We removed this, scrubbed it clean, and painted it with some black spray paint. Removing the shell revealed this. Dry rot. We probably should have expected it, but what we really needed to do now was to reframe much of the tub. If you run into a similar issue don’t panic. Here is how to fix it. Many of the supports looked like this when we pulled off the hot tub wrap. The damage was enough that I could easily poke a finger through the bottoms of the boards. Here is another shot of the corner supports. Our hot tub supports were 2×2 boards, and we just happened to have a bunch of those in the garge. Lucky, eh? We removed the damaged material a couple at a time and cut the new supports so that they would fit tightly. Here’s what the frame looked like after replacing 8 of the supports. Please note that in this case the reframing consisted of entirely the side supports. The base support was replaced when the tub was placed five years ago, and the pressurized wood has held up great. If it had not we would have had to tip the tub onto its side to replace those pieces. We started by replacing the newly painted toe toe kick. The toe kick is topped with a 1×2 board that we grooved on the bottom to notch over the plastic kicker. After that the first layer was some polystyrene, which fits between that 1×2 board and the similar dimension top board. In our case three of the four sides were in pretty good shape and we simply reused them. For the fourth side we picked up a 4×8 sheet of polystyrene foam insulation at Lowes and cut it to size. The polystyrene is followed by a layer of osb, which we cut to size and nailed to the 1×2 boards. For the final layer (the pretty part) we used 5.5″ wide cedar boards, which were $1.82 at Lowes. We were able to get two panels per board, for a total of 32 boards. We started at the corners and nailed those together first with a finish gun, then nailed them too the side of the tub. These final panels should extend past the bottom of the osb and 1×2 nailer by about an inch. This will prohibit any rain from getting up into the under-layers. Corner boards may also be raised above the rest of the paneling, but in our case we were not replacing that top shelf, and we did not want the corners to protrude past the existing 45 degree corners you can see in this photo. The rest of the panels were nailed to the sides. It was necessary to rip one piece per side to make everything fit in nicely. Around here we work with a little additional help. Another siding trick is to stop every few boards and measure the remaining distance between the last board you placed and the next corner board. Do this for the top and the bottom, because that distance will change as you work and you want to keep it as even as possible. Because we used rough cedar pickets we had to sand the sides. In this photo the right side is sanded and the left is not. To finish the look we added 1×2 trim to the top and bottom. We left the boards their natural color and coated them with a couple coats of spar urethane. I will add a final third coat today. $33.14 for the two quarts of spar urethane it required to cover everything. 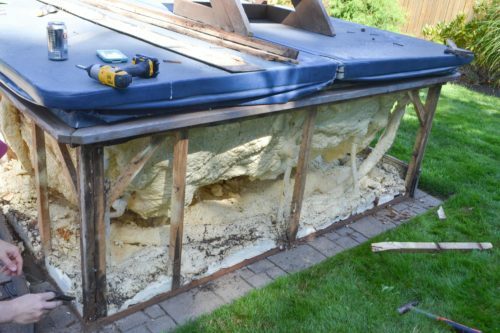 That brings the total for this hot tub reframe and restoration to $128.56. Not too shabby, and our backyard looks soooo much better! Our plan is to build some stairs and a couple cabinets for towels along the front of the tub. We also have to replace the old worn out cover, which we are working on right now. It is so nice to have that old broken down shell gone. We are happy with how it turned out, and with how inexpensively we were able to do it. Did you leave an access door or plan a way to easily remove the sides for maintenance? Yes. The front panel is attached with screws so we can access all of the mechanics. Thanks for bringing that point up, it’s an important one! I recently bought a run down hot tub with the intention of repairing it. I want to have a nice one that I’d be able to use every day, but this one is starting to look like more of a job every day. I’ll have to look into having professionals do the repair because while doing something like you did could be nice, I don’t have the skills or patience to do a good job with what mine needs. Thanks for the post! Nice job but the picture of everyone clustered around the nail gun with no safety glasses really spooked me. Safety first. I love what you’ve done here. I’ve been thinking of tackling this same project with my existing hot tub. Can you tell me, do the supports lift up the hot tub from laying on the ground? What was the length of the supports? Our wood frame sits right on the ground, which is why we had some rot there. I would recommend using pressure treated because of that, and, well, because it’s a moist environment. I don’t recall the length of the supports now, but what we did was use the old boards as a template for the new. We did not change any of the dimensions. I hope that helps. Let me know if you have any more questions! Please send advice for restoring rounded corners for a Sundance Cameo hot tub. Great post. Love the pics. It’s refreshing to see Dad and the kids all working on a project. There is nothing better than teaching the next generation how to DIY. I recently got a hot tub from a friend that does not have a cabinet, so I don’t have a template from the old, but your pictures have helped me to see how I need to build it. Thanks from Florida. We love it when the kids get involved! Good luck with your hot tub! Me and my boys were planning on doing the same to a Caldera we have. I still can’t find cedar boards as cheap as you did at Lowes. You don’t happen to have a part number do you? Unfortunately, no. It may be one of those things where you have to watch the stock and see what they have. Good luck!